How do I hold them accountable without making them translate on interpretive tasks? Oh and I also want it to be quick to make! On Monday they read two infographics about winter traditions in Hispanic countries (Día de Reyes and Año Nuevo). They did some Venn Diagrams in groups that compared the traditions to American ones. Simple, good for discussion, etc. Some students only half-way did the assignment and let other students in the groups do most of the work. So my big question was: WHAT did they LEARN? 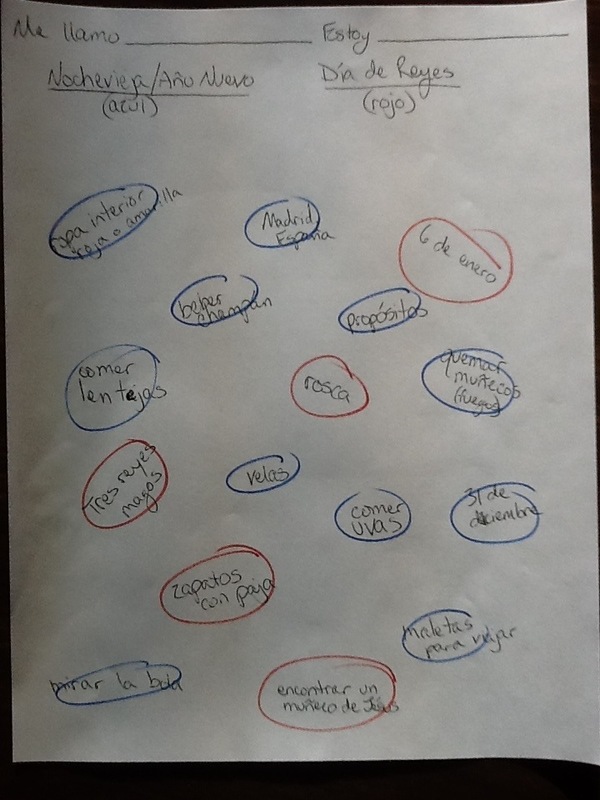 The next day, I gave a pop quiz that is all in the target language like a sorting activity. I made this while I waited in line at the copier, so please don’t judge me. I asked the students to circle the New Year traditions in blue and the King’s Day ones in red. If you don’t have enough markers, they could draw circles or Xs. I only expected them to get 6 correct since I sprung this on them as a pop quiz and it was the first time I’ve done this. I was pleased with the results and a few students said that they needed to “read more carefully” and “read to learn” next time. I thought those were some good reflections for high schools students. How do you assess them in the target language on Interpretive tasks? Could you post the link to the info graphics you used? I need to incorporate more culture into my classes, and this is a great way to do it! The easiest way is to search in Google images. Put “infografia” and whatever topic you want. I searched “infografia Nuevo ano” and “infografia Día reyes” for these. The only trick is getting a clear copy. I usually go to the site to copy it. Muchas gracias! This is a much more interesting way for kids to read about culture/customs! What level did you use this for? I teach Spanish I, and my students wouldn’t be able to understand a lot of the verbs/tenses and vocabulary (which they could look up in the dictionary). How do you format this for level 1 students? I used it with all my levels. 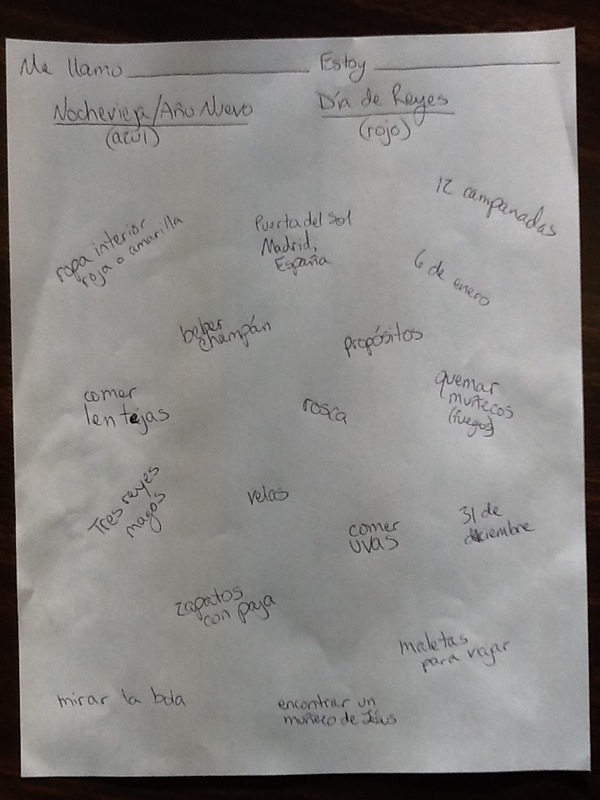 Since this is a little harder, we went over it together looking for cognates and key words. The pictures helped them figure out some. I asked… What do you think “uvas” means here? What do they do with them? Then I filled in the missing info. I try to always use authentic readings and alter the task for the level. I’ll do a post about that soon! I have been assessing them based on how much they understand-novice or intermediate level and then recording that on a running record. I record whether they understand words, phrases or if they comprehend (for the most part) the entire selection by having them write a summary-not a translation. I usually preteach important vocab (not more that 3-4 words), look at picture clues and circling cognates. I like a summary better than asking questions because my goal in having them read is to try and find out the gist-not know every single word. Last week students read a five paragraph selection (had present/preterite tense verbs) and could not believe how much they understood-goal accomplished! Sounds great! Do you have a rubric that you could share? I love this! Going to use it with descriptions this week – What do you think my categories should be??? Positive characteristics and Negative Characteristics? What else could I do? Maybe you could put a picture up of a person, they pick the words that describe him/her? Love it! Want to try it with my Spanish 3 this week. We are starting a unit on friendship. Circle the attributes you look for in a friend in red. Can’t wait to try it. Gracias.